Er MNN Auger peaks between 50eV-700eV overlap many XPS regions from other elements. Er4d region exhibits complex multiplet splitting. Not straightforward to peak fit. 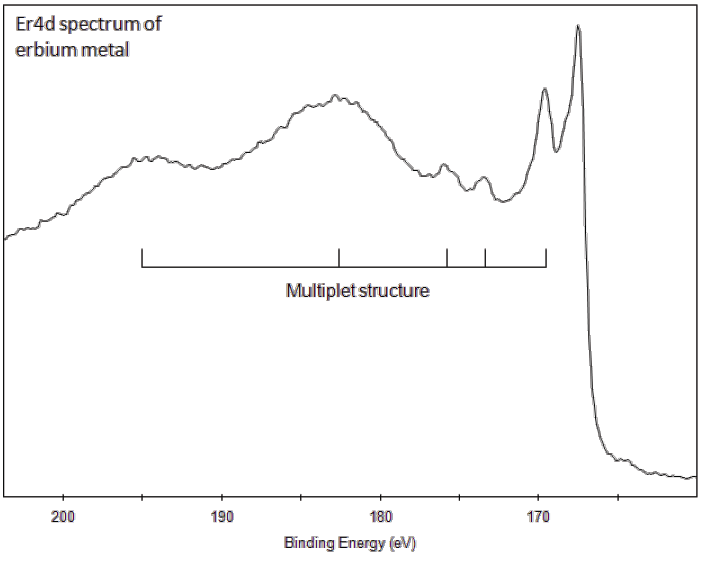 Erbium metal, for example, has at last 6 peaks in the Er4d region. Erbium is commonly used as an amplifier dopant for fibre optics in the telecomms industry. Erbium, along with other rare elements, is in the mineral gadolinite from Ytterby in Sweden. It is used as a photographic filter and also as a neutron absorber in nuclear technology. Because of its oxide’s pink color, it is sometimes used as a glass and porcelain enamel glaze colorant yielding glass that is used in sunglasses and inexpensive jewelry. Metallic erbium’s dust presents a fire and explosion hazard. This element gives characteristic sharp absorption spectra in the near infrared, visible light and ultraviolet regions. 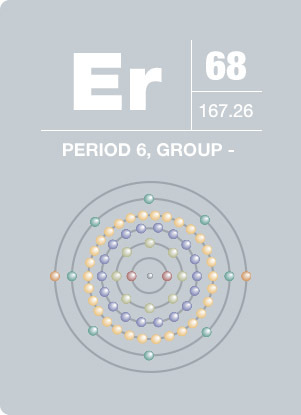 Erbium plays no known biological role and is never found free in nature.